Ed Miliband has outlined his party’s ambitious plans in Labour’s 2015 manifesto, including pledges to balancing the books, cut Britain’s deficit year-on-year and increasing the minimum wage. A new Labour government would be committed to a “budget responsibility lock,” whereby every policy announced would not require any additional borrowing. 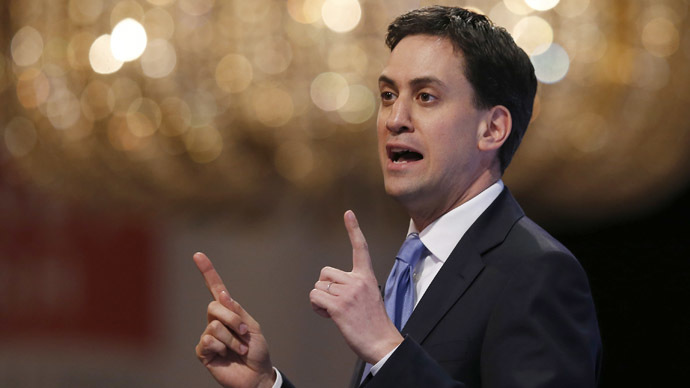 “This is a plan to change our country,” Miliband said, as he launched the manifesto in Manchester on Monday. Notable pledges highlighted at the launch included increasing the minimum wage to £8 an hour. Labour also pledged to freeze rail fares for a year, freeze gas and electricity bills until 2017, ban some zero-hour contracts and cut tuition fees from £9,000 to £6,000 per year. The Conservatives and Liberal Democrats will launch their manifestos later this week. When it comes to foreign policies, securing peace in the Middle East and finding “a comprehensive two-state solution” for Israel and the Palestinians are a key aim for his party. The manifesto says: “Peace and security in the Middle East are one of Labour’s most important foreign policy objectives. “We will challenge prejudice before it grows, whether in schools, universities or on social media. And we will strengthen the law on disability, homophobic, and transphobic hate crime,” it says. Critics, even among his own party, have quickly come out to criticize Clegg’s remarks. Labour’s keynote pledge to cut the deficit and refrain from borrowing is the focus of several analysis and commentators. The Institute for Fiscal Studies (IFS) said to achieve balancing the books could mean Labour may introduce “significant spending cuts or tax rises.” Such measures would either need to take place early on in the parliament or not at all. IFS Director Paul Johnson said: “They are committed to getting a current budget balance – a current budget surplus – by the end of the parliament. That's an entirely credible fiscal policy. But they continue to not to give us any sense as to how quickly they want to achieve that.